Cleome hassleriana, commonly known as spider flower, spider plant, pink queen, or Grandfather's Whiskers, is a species of flowering plant in the genus Cleome of the family Cleomaceae, native to southern South America in Argentina, Paraguay, Uruguay, and southeast Brazil. It has also been introduced to South Asia, including the Haor area of Bangladesh. It is an annual growing to a height of 150 cm (60 in), with spirally arranged leaves. The leaves are palmately compound, with five or seven leaflets, the leaflets up to 12 cm (5 in) long and 4 cm (2 in) broad and the leaf petiole up to 15 cm (6 in) long. The flowers are purple, pink, or white, with four petals and six long stamens. The fruit is a capsule up to 15 cm long and 3 mm (0.1 in) broad, containing several seeds. Flowering lasts from late spring to early fall. C. hassleriana is commonly cultivated in temperate regions as a half-hardy annual. Numerous cultivars have been selected for flower color and other attributes. The "Queen" series includes the cultivars 'Violet Queen', 'Rose Queen', and 'White Queen'. The cultivar 'Helen Campbell' has gained the Royal Horticultural Society's Award of Garden Merit (confirmed 2017). 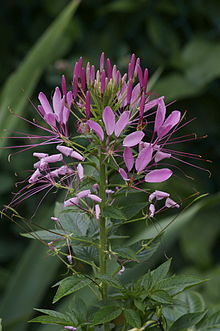 Plants in cultivation have at times been misidentified as Cleome arborea, C. pungens or C. spinosa. ^ a b Huxley, A., ed. (1992). New RHS Dictionary of Gardening 1: 652. Macmillan ISBN 1-56159-001-0. ^ a b c "Tarenaya hassleriana". Germplasm Resources Information Network (GRIN). Agricultural Research Service (ARS), United States Department of Agriculture (USDA). Retrieved 16 January 2018. ^ "RHS Plantfinder - Cleome hassleriana". Retrieved 30 January 2018. This page was last edited on 15 November 2018, at 22:43 (UTC).